Back in 2016, I ventured to downtown Toronto and visited one of the city’s many eBike stores. I had always shunned this mode of transportation as I considered it a waste of money and a passing trend. Briefly after walking into the store, I was immediately attracted to the electric scooter, which doesn’t operate like a bike in the traditional sense and actually looks more like a Vespa. The scooter I bought set me back about $1,500 CAD after I opted for a lithium battery versus a lead acid power source. Going this route resulted in longer battery life and added a bit of speed to the scooter — mainly because lithium is lighter than lead acid. At the time, there were no restrictions on riding an electric bike or scooters in Toronto. There was no need for a license, registration or insurance. Two years later, that’s still the case. I felt like a champion on the streets of Toronto. I also felt like a super dork. I was busting through downtown Toronto to Bloor West in just 17 minutes. Total time savings per day amounted to one hour, but my focus while riding wasn’t really safety and was instead to just speed ahead of others as I bombed through the bike lane, which was fair game due to the City of Toronto’s lack of rules regarding e-bikes in the bike lane. Life was amazing. Freeing. The wind was flowing through my bald head. Unfortunately, my precious electric scooter was stolen on a gloomy September day. Life became sad and so did my sense of direction. I was forced to become one of the masses on public transit and I started passing the time with offline Netflix viewing. Ever since the moment my ebike disappeared, I’ve been reluctant to drop more money on a new electric vehicle because parking is an issue, coupled with locking up the bike securely. 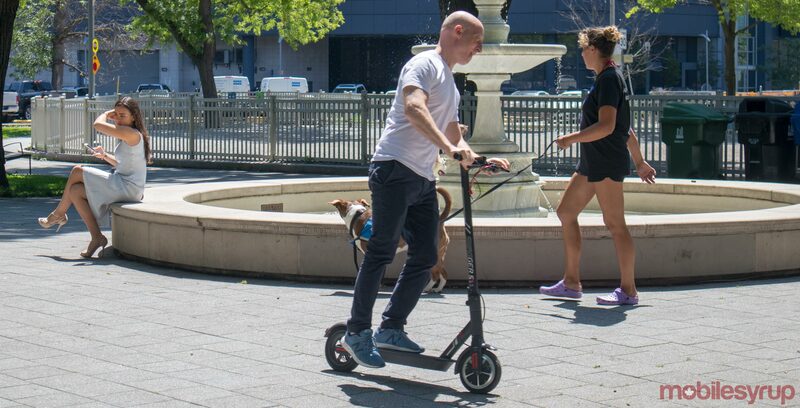 Not the eBike or scooter, but a stand-up electric scooter. You’ve probably seen them make the news recently as a variety of rental services have popped up in the San Francisco Bay Area from companies like Bird, Lime and Spin. Swagtron, a South Bend, Indiana, based-company sent us an email to see if we were interested in reviewing the Swagtron Swagger 5. I said yes as it had the potential to bring me back to my glory days. The Swagger 5 arrived at our office in a big, heavy package. 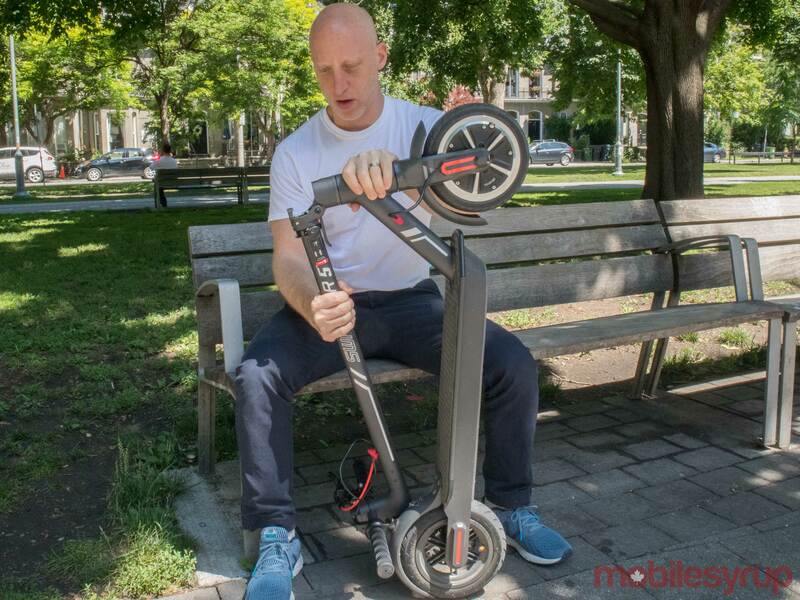 After a quick unboxing of the $500 eScooter, it reminded me of Chinese manufacturer Xiaomi’s M365 electric scooter — the same scooter rental company Bird uses. The aluminium framed Swagger 5 is sturdy and can take a few hits as it comes in at a heavy 26lbs. 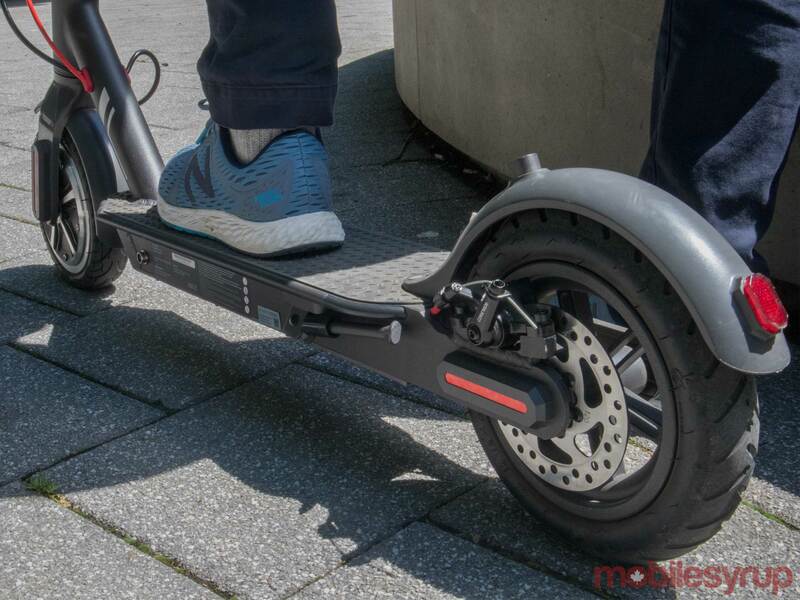 The scooter also features a 250-watt motor and a ‘long lasting’ Li-ion battery (158.4Wh) that takes 3.5 hours to fully recharge, two 8.5-inch air-filled tires that can go 29 km/hour (18mph), which lasts 18 km (approximately 11mph). 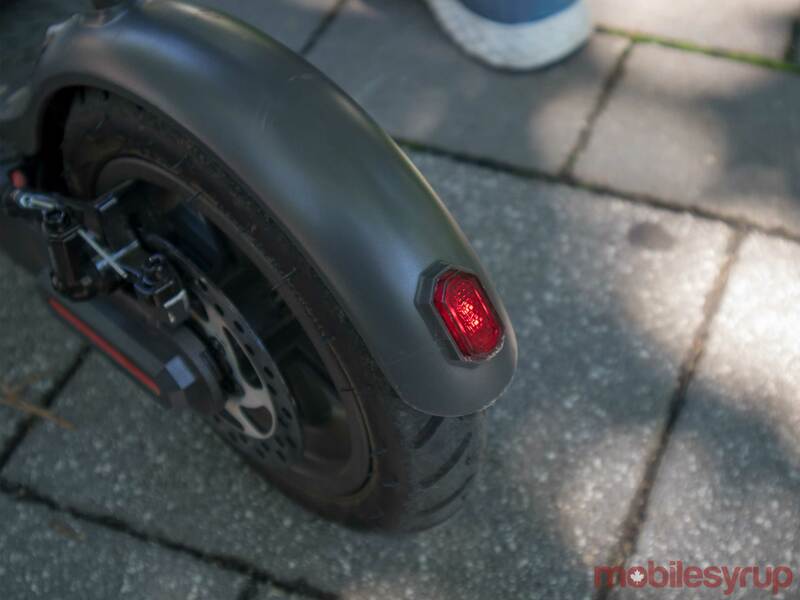 Your speed and battery life can be viewed on the scooter’s LED display as well. The Swagtron 5 is designed for those that aim to quickly travel short distances, acting as a ‘last mile’ form of transportation. 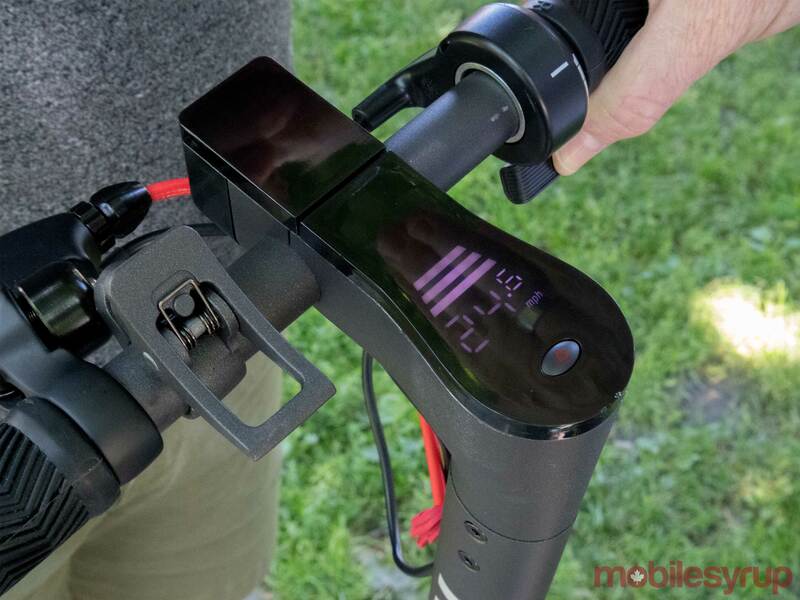 After a quick charge-up, I was pleasantly surprised with how easy it is to handle and get moving. While riding the Swagger 5 is not the safest mode of transportation — you should always wear a helmet — it certainly gives you the same level of confidence as a bicycle. My top speed averaged out at the listed 29km. Downhill resulted in a bit more speed, with the scooter reaching just over 31km. However, where the Swagtron declines is on hills. My home is approximately 10.5 kilometres away from our downtown Toronto office. The route is mainly flat but there’s also a massive hill at the end of my route. The battery drained and eventually expired within 8km on my first commute, or just before tackling this big incline. I eventually ended up using my own naturally born energy and scootered the rest of the way home with my feet. With that said, Swagtron notes the Swagger 5’s optimal incline is only 10 degrees. Where the Swagger 5 excels is short distances and booting around to do quick errands. A quick ride to the bank, liquor store or just visiting neighbours is worth the expense. The Swagger 5 gets you to where you need to go faster.here is an iOS and Android app that allows riders to pair their device via Bluetooth. If you activate the app you’re given the option to select your speed and use cruise control to conserve battery life. In addition, you can also plan your route and use the scooter’s headlights. It’s more than likely that if you’re taking the Swagtron scooter to work, you’re going to fold it up and store it in the office somewhere discreet. One of my concerns with the eScooter from yesteryear was theft. The good news about the Swagger 5 app is that it also includes a ‘theft-deterrent lock and alarm mode’ that gives some piece of mind. The Swagtron Swagger 5 attracts attention and looks. 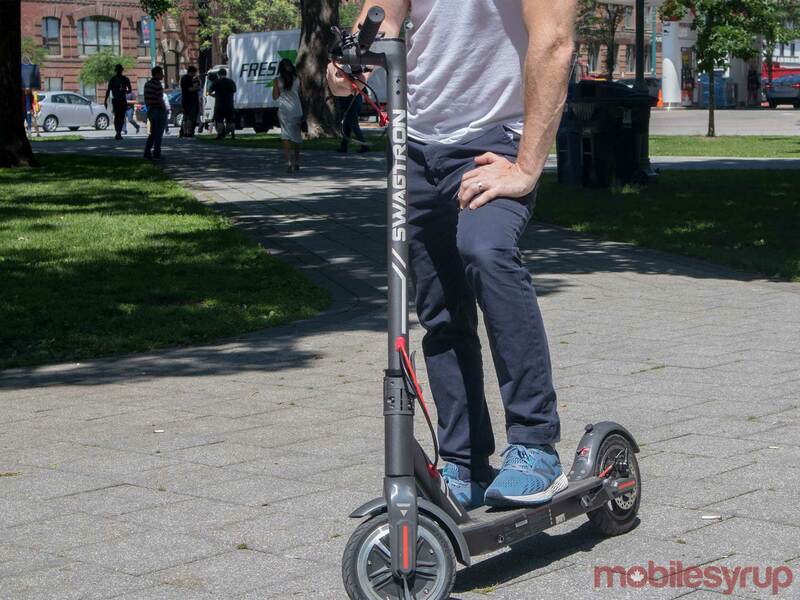 If your goal is to travel from point a to point b in the fastest manner possible and want to feel like a champ, then this scooter is a good alternative for short distances. The Swagtron Swagger 5 is priced at $399 USD through the company's official website, which comes to about $522 CAD. Dreams do come back alive.